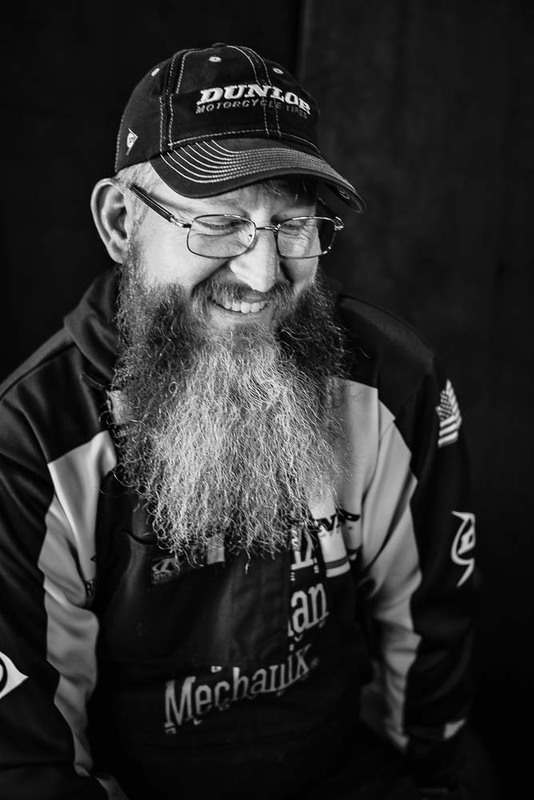 Twenty-year photography veteran, LaRae Lobdell, shares her latest portrait series, Men of MotoAmerica. Read on to learn how LaRae executed the project, from convincing her subjects to be photographed to finishing the images with her "secret" Totally Rad recipe. 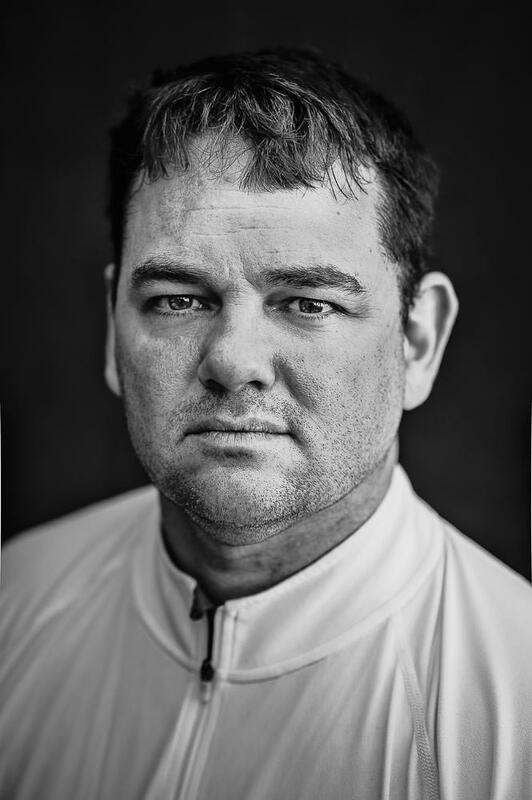 I am a portrait photographer, artist consultant, and online personality with nearly 20 years of experience photographing, producing exhibits, and speaking in the photography industry. My relationship with photography began as an elective class in community college. After hand-processing my second roll of Kodak Tri-X film in D-76 1:1, I was hooked. At the time, I was living in Spokane, WA and connected with my first mentor who invited me to spend a summer assisting him photographing weddings and high school seniors. I still remember the first wedding assignment he sent me out on: he handed me his his Hasselblad 503c; two rolls of 120 film, one in black and white, and one in color; a Minolta light meter; and a shot list of ten must-have moments from the wedding. That meant I had a total of 24 frames to capture the most important day in his clients’ lives. I was shaking and sweating until the proofs came back. After a constructive critique, he gave me a check for $72 and my next wedding assignment. At the end of the year I moved to Seattle and his parting words to me were, “Don’t wait to buy one more piece of gear or take one more class. You already know the psychology and technicality to capture the shot list. Now you just need to actually do it over and over. Start your business the day you get to Seattle.” So I did. That was 1998. By 2000 I was photographing weddings in other states, and by 2003 I was photographing destination weddings in other countries. My portfolio and technique grew tremendously throughout those years and by the end of the decade I had thought myself so much marketing and social media that I took a break from my own business to help BlackRapid, Inc. launch the world’s first camera strap designed just for woman. After traveling to trade shows around the globe with them for a couple of years, I was asked by CreativeLive to be a lead host where not only did I learn skills to be in front of the camera, but my photography knowledge behind the camera blossomed as I sat through each class listening and learning from some of the world’s best photographers. In 2012 I applied all this knowledge to a personal project and earned notoriety in my portrait photography work and was photographing celebrities. Unknowingly, I also had accomplished reinventing my professional repertoire from weddings to male portraiture and had moved to Miami, FL where I currently reside. I now shoot editorial assignments for magazines and artists, provide marketing consulting to startups and colleagues, and am the new main host and an instructor for Polaroid’s new online photography platform which I am thrilled to be a part of. I find that while women are absolutely beautiful and enjoyable to photograph, directing and capturing a man in a still image is more much more challenging and a dare I enjoy taking on. It is difficult to make a strong, distant, man personable and approachable; or a slight, reserved man, come across strong and confident. I love finding the platonic rapport and providing a safe environment where a man can be his true self without any expectations put upon him; he always shines through as the knight he is truly meant to be. What prompted you to start this project? How did you go about getting subjects to photograph? Over the last few years, I have been taking environmental portraits and behind-the-scenes photos of AMA pro riders at tracks in Seattle WA, Portland OR, Miami, FL, and Atlanta GA. I’d set up big strobe lights on the track with generators, have a few assistants holding reflectors, and got all technical creating light in a beautiful and artistic way. But working with these professional male athletes was different than any other type of genre of people I had worked with before. 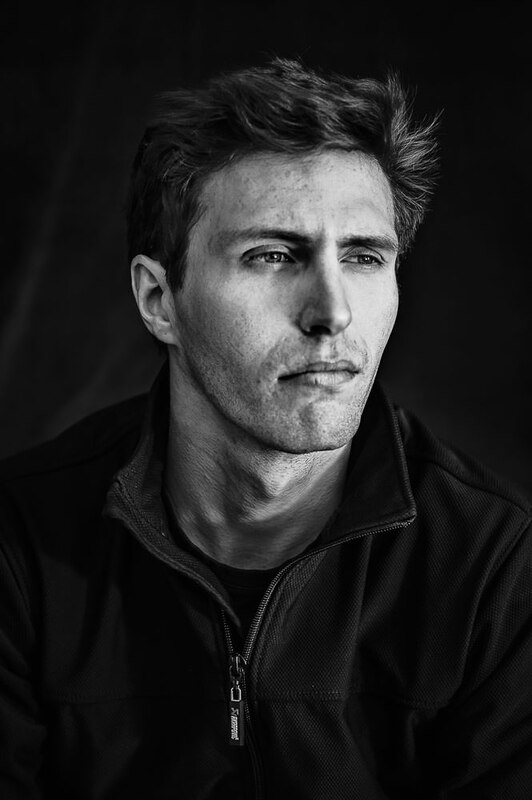 I knew I needed to simplify my approach of photography and get back down to my roots by shooting black and white portraits in all natural light, taking out all the gear and focusing on the individual in front of me. 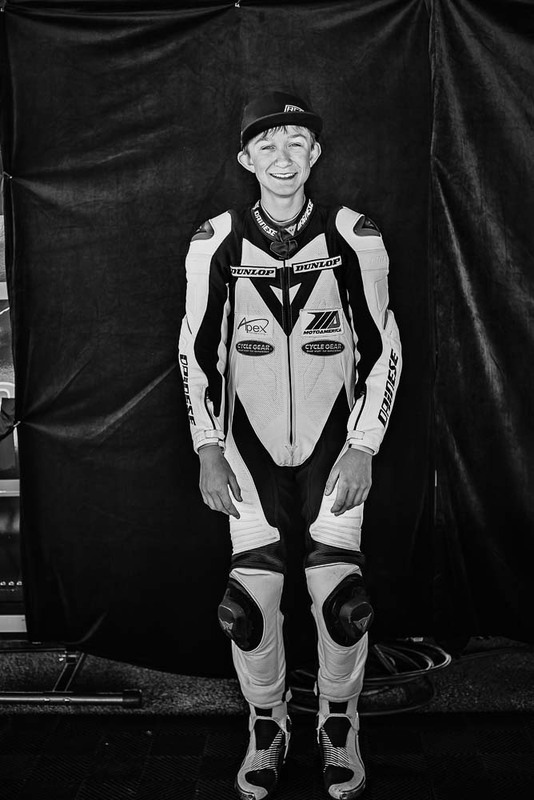 So I created and designed this image series to have a completely different look into the rider's’ personal lives while at work while also bringing the sport up-to-date and mainstream for the global audience through features on my blog and social media, and with the ultimate goal of changing the visual landscape of motorcycle racing in America. Armed with this mission, I approached a few of the guys I had already photographed before, and in between races they agreed to sit and have their portrait taken by me again. But simplified. My photography setup I designed for this is a “K.I.S.S.” pop-up studio. No, not the heavy metal band, and no, not how a girl seals love notes to her crush in junior high. I’m talking about “Keep It Simple Stupid”. As photographers we get a little too caught up with gear and forget to go back to our basics to capture pure portraits with truthiness. So I used two black velvet curtains purchased from a Goodwill store as a backdrop either gaffer taped to the side of a trailer or A-clamped to the paddock tent poles. I shot with a Nikon D750 FX-format Digital SLR Camera Body, and either a Nikon 50mm f/1.8D AF Nikkor Lens or Nikon 85mm f/1.8D AF Nikkor Lens . Natural light only. Rain or shine. No reflectors. Once I had a few different subjects in the can for this series, I wrote up a personal project business plan and printed it out with deliverable expectations and model release signature agreements, emailed the heads of MotoAmerica requesting and receiving a full press pass to the races, showed up race weekend and went to each tent introducing myself and the project to every team owner and CEO I could find. I was pulling the pop-up studio in a little homemade wagon behind me and if they agreed to let me shoot their team I got to work setting up right then and there, and often I’d be asked to come back the next day or meet them at another race in the future. What was the most challenging aspect of making these images? Trying to win the trust of each man and photograph his true self in just a few seconds. Remember, these guys didn’t know me, where I came from, or my professional history. I was pretty much a nobody-chick with a camera asking for signature releases with the promise of a cool visual project that would provide press through my photography blog which could possibly elevate their careers. Another big challenge is that they are all very hyper-focused on race weekends, so I only had seconds to pitch the idea, build a rapport, and capture their portrait. I’d estimate that after introducing myself and the project, I was turned down at least 9 out of 10 times. All of the elements that added to this personal project was a big endeavor, but I’m really grateful and happy how this first phase of the project turned out. Believing in myself, my idea, and fueling my own confidence was key to the approach and outcome. Walk us through your editing process. How did you achieve these beautiful black and whites? My post-processing is all done in Lightroom CC 215 using my own custom recipes made with Totally Rad!’s Lightroom Presets, Totally Rad!’s Replichrome I: Icons, with a final polish in Photoshop CC 2015 using more custom special sauce with Totally Rad!’s TR Action Mix 1 + TR Action Mix 2: The Revenge. I’ve been using the Totally Rad actions and presets since 2007 and have made my own custom recipes for each step. Not to give away my secret recipes, I’m sharing with you and your followers my essential Totally Rad! ingredients I love using for every single image I process! Totally Rad! Basics: a few of the Auto presets with my own manual adjustments to one or more of exposure, contrast, highlights, shadows, whites, blacks, clarity, and tone curve. Since each photograph is in natural light at different times of years and in different areas of the country, the basics naturally vary, so I just get them all to the same overall exposure. Replichrome - Black + White: Kodak Tri-X 400 + with manual reduction to the Grain amount, size, and roughness. After I perfect my unique “look” in Lightroom I save it as a new User Preset called “LaRae’s Totally Rad! B&W Basic Look” and apply it to every single image in the series, and modify the basic exposure, contrast, and tone curve as necessary for each subject session. Once I’m happy with the overall processing of each of my images, I export as a PSD and open each one into Photoshop CC 2015. I first open the file and add a new layer and fix any really obvious blemishes on faces, hands, or distracting labels from the background using the stamp and/or healing brush(es). It is important to me to keep the subjects true facial features like wrinkles, dirt, facial scruff, etc. so I leave all of those details as truthfully as possible. My rule is that I don’t want to change any feature that adds to the character of who they are at age or space in life, yet I do want to simplify any blemishes that are temporary to them that they would later look back on in ten years from now wishing they didn’t have to look at. I am not a plastic surgeon but I will allow myself to be a very understated makeup artist in post. Yin/Yang: dodge and burn baby! I find that hair on heads tend to look darker and facial hair looks lighter, so I “Yang” their hair and “Yin” their beards. I also “Yin” background noise and foreheads. I leave oil stains on their jeans and clothing because I love the detail it adds to the individual’s story in the portrait. BAMF 8-Bit (B&W): reduce that opacity about 75%. Select-O-Pop: to the face and any other cool details in the image with one single brush stroke at 10%. Yup, at the end, I save all of these layers as a new action for myself called “LaRae’s Totally Rad! B&W Basic Look” in Photoshop and apply to each image upon opening.